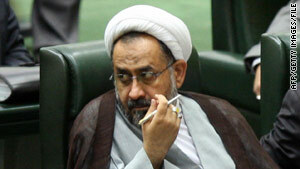 Iranian Intelligence Minister Heydar Moslehi, seen in a 2009 photo, announced the arrests of "nuclear spies." (CNN) -- Iran arrested a number of "nuclear spies," its intelligence minister said, in the wake of widespread reports of a sophisticated new computer virus that may have been aimed at Iran. Intelligence Minister Heydar Moslehi made the announcement Saturday, without giving any details, Iran's semiofficial Mehr news agency reported. Iran is widely thought to have been the most likely target of the Stuxnet virus, which a top computer security expert told CNN was "the most complex piece of malware in the history of computing." Tehran has insisted its controversial nuclear program had not been compromised by the virus. Moslehi, the intelligence chief, did not mention Stuxnet in his statement, but said his ministry has "absolute control over the virtual networks and will foil all acts of sabotage." Ralph Langner, who was among the first to identify and study Stuxnet, told CNN last week that it would have required insider information to deliver. "In order to do the attack as Stuxnet did, you also need to have very detailed and specific knowledge about the targeted application and process," he said. "So you also need insider knowledge from a process control system person." The virus, which he called "a cyberwar weapon," is designed to attack industrial control systems. It is so sophisticated, he said, that it is designed to attack a specific machine only when it fulfils specific conditions, such as reaching a particular temperature or pressure, he said. He said it had to be the work of a government, rather than a hacker group, because of the resources required to build and test it. He did not speculate in an interview with CNN about who might be behind it, but asked mischievously last month on his website if there would be Israelis at the conference where he was presenting his Stuxnet findings. Israel and the United States are both deeply concerned about Iran's nuclear program. They believe Iran aims to build a nuclear bomb. Iran denies it.